Swasthani is the Hindu Goddess who is very blessing to all her devotees She always fulfills wishes of all those who worship her with the pure heart and full devotion. Goddess Swasthani is believed to be the four-handed goddess with charka, Trishul, sword, and lotus in each of her hand. She is sitting in the center of Asta Matrika or eight Goddess of power. The Astha Matrika are Mahakali, Vaishnavi, Brahmi Maheswari, Kaumeshwari, Barahi, Indrayani, and Chamunda. The Astha Matrika is also believed to be blessing the eight knots of Daura in Nepali dress Daura Surwal. Swasthani Brata Katha is a series of stories narrated by Lord Kumar to Agasthya Muni (Saint). Kumar is the elder son of Lord Shiva and Goddess Parvati. The story mostly concentrates around Lord Shiva. It is also called Skanda Puran. It is also a form of prayer to Lord Shiva and his various forms. Katha commences on full moon day of the month of Poush/Magh (January) and goes on series of 31 Chapters for 31 days till next full moon. During this lunar month, the story of Swasthani Mata is recited in households of Nepal. (It is a long tradition; however, it is not compulsory to recite the story or to observe the fasting). 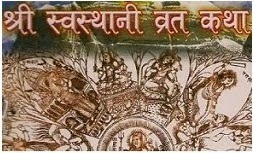 Swasthani Brata Katha is written in Nepali. Some believe that it was first written in Newari before it is written in Nepali. It is said, people of Sankhu still have a handwritten Swasthani book in Newari language. However, the story narration is little different in other languages than in the Nepali language. Some women fast for the whole month and take only one meal a day and read the story of Swosthani Mata in midafternoon. People who do not fast also narrate the story either early in the morning or in the evening before the meal. Before reciting the story, they worship the Swosthani Barta Story Book with Abir, Kesari, and Jau Til and flowers, Dhup Batti, and Diyo. They cook special offering to goddess Swasthani. Especially Sesame Laddu is seen in every household. The fasting women offer Dhup Batti, Laddu, and flowers in 108 counts each. It is believed that if you take the fasting of Goddess Swasthani, she fulfills all your good wishes. Sali Nadi, the river in Sankhu is mentioned in the Swasthani Barta Katha. Therefore, the river is a prime holy location for devotees to visit during the month of Swasthani. The stories in this Swosthani Katha are mainly about devotees, who perform sins due to their ignorance and their rescue by Goddess Swasthani. The main focus of few first Chapters in Swasthani Brata Katha is Goddess Parvati. Few Chapters are about Lord Shiva’s first wife Sati Devi’s sufferings and Shree Swasthani rescuing her from troubles and sufferings. The final day of Katha people performs special symbolic worships. It is a tradition of painting the Mahamantra Om in copper plate and a mud Shiva Linga is made in the plate on the Om symbol. The pooja of Shiva Linga on the final day, concludes Sri Swasthani Brata Katha.